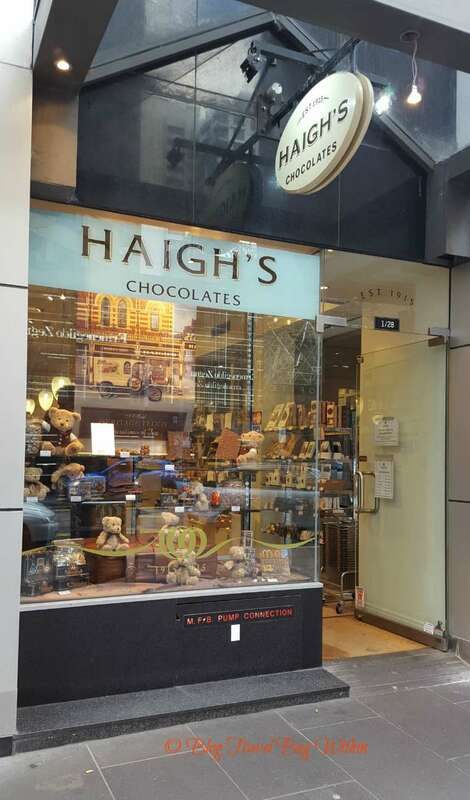 also be of interest to Mum and Dad who’ve previously visited Melbourne. My boys are aged 16.5, 12 and 12. The trip was actually the twin’s birthday presents. 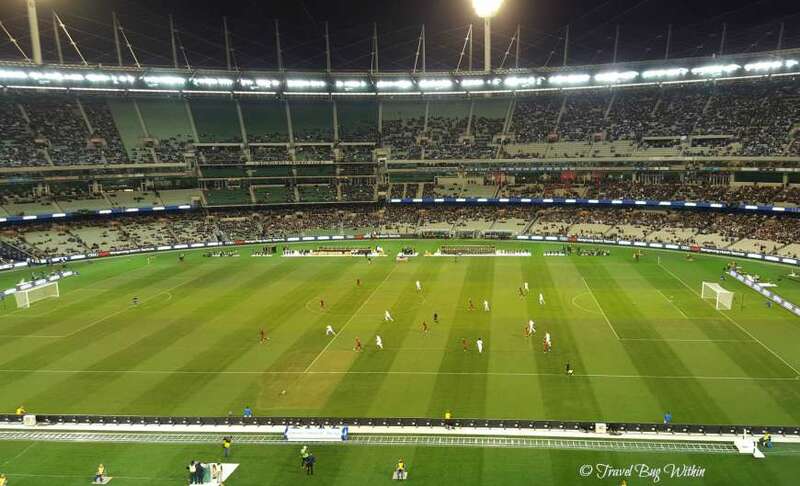 They turned 12 the day before we flew out and were presented with a surprise trip to Melbourne to see their favourite soccer team Real Madrid CF vs AS Roma – a friendly soccer game at the MCG. 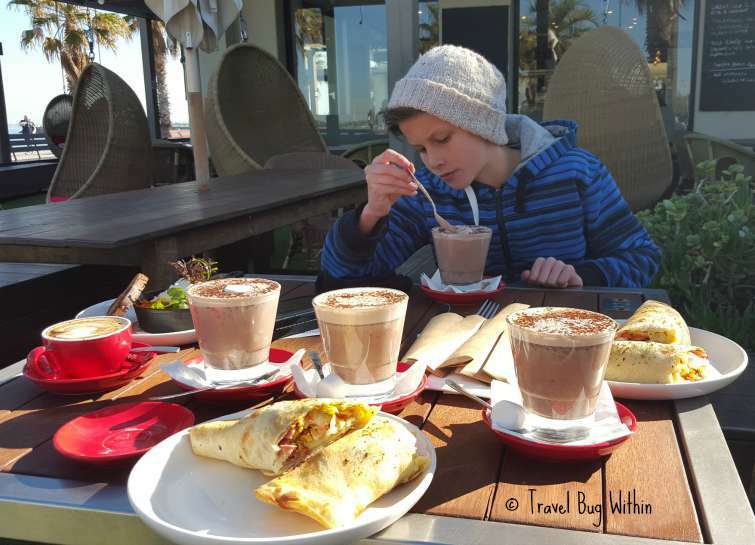 I travelled with my ex-husband (yes this trip was about our kids and creating memories!) Booking these tickets five months earlier with the foresight recognising what an “unforgettable” birthday experience this would be a day after their birthday. And it was a great surprise despite a few dramas leading up to the day. Trying to keep their present a secret; attempting to explain why they can’t have a party with their friends on the Saturday after their birthday thankfully were forgotten about on the morning of their birthday. 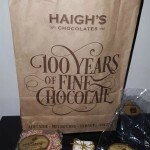 Surprises are a great idea – but anyone who has been behind organising one knows how they can bite you in the proverbial leading up to the surpise! 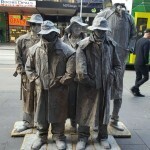 I digress – back to our 30 hours in Melbourne and what we packed into this time frame. A quick check in, dump bags and head off with street map in hand to discover Melbourne’s CBD. With the weather a pleasant 15 degrees, it was an easy 20 minute walk to the centre of Melbourne CBD where we intended to check out the graffiti walk. Doing some pre-trip research, I figured street graffiti interests kids – especially if it’s slightly rebellious looking. 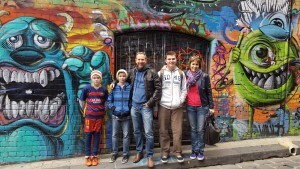 Walking along Flinders Street we turned right and found Hosier Lane near Modiva Restaurant. 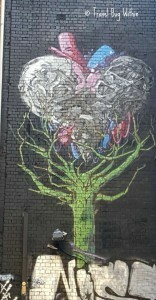 From a prior trip to Melbourne I knew this area hid a few laneways of street art. Hosier Lane received a big tick from the boys and provided many photo opportunities. With tummies growling (plane food nowadays never seems very generous) it was time to make a food stop. So many choices. 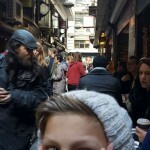 Mum was hoping the lads would like the cafes at the Laneways, as it was close to Hosier Lane and offers a unique Melbourne food experience. Entering the narrow cobblestone streets, jammed with people and no cars, cafes tumble out on to the laneways. It was a challenge to locate a café to accommodate five of us. It was midday and lunch time crowds filled many of the tables inside and outside. We spied a table near the Issus Café and Bar and grabbed it – can’t hesitate in making a seating choice at this time of day. The passing people traffic do wander past fairly close to your table and for the adults this is part of the Laneways atmosphere and charm – people watching. But our younger two felt it was a little crowded and busy – made a few complaints. But there were no issues with the food. 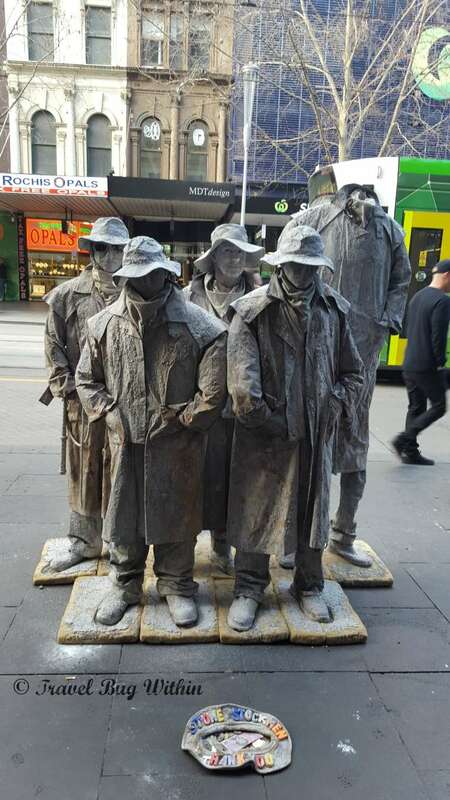 With a sugar rush from the chocolates sampled and purchased, we wandered over to the Bourke Street Mall and watched a street performer before ending up at Rebel Sport. The twins wanted to look at soccer boots. 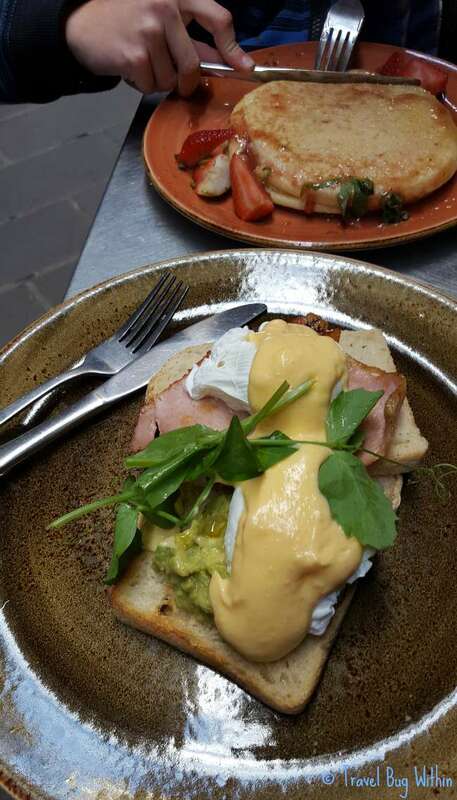 Why come to Melbourne to visit Rebel? Apparently their range of boots is better than Brisbane! 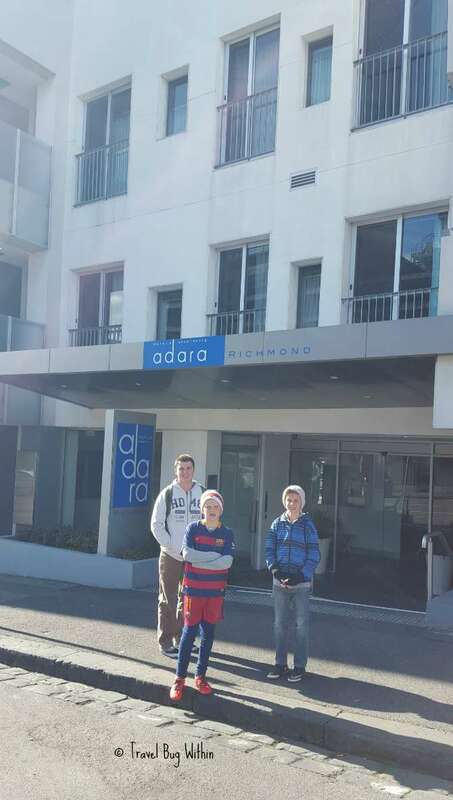 Dad felt it was time to take the twins back to the Hotel for some R & R before the big match at the MCG. Mum and older son seized the opportunity to shop for a few hours before racing back to the Hotel to change and rug up for cool night ahead at the MCG. 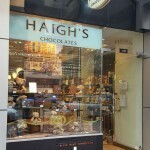 Did I mention how muh I love Haigh’s chocolates? 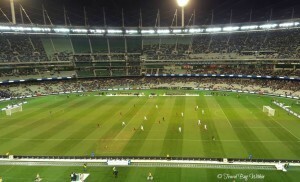 My childhood was filled with many hours were spent in front of the TV watching cricket matches at the MCG. 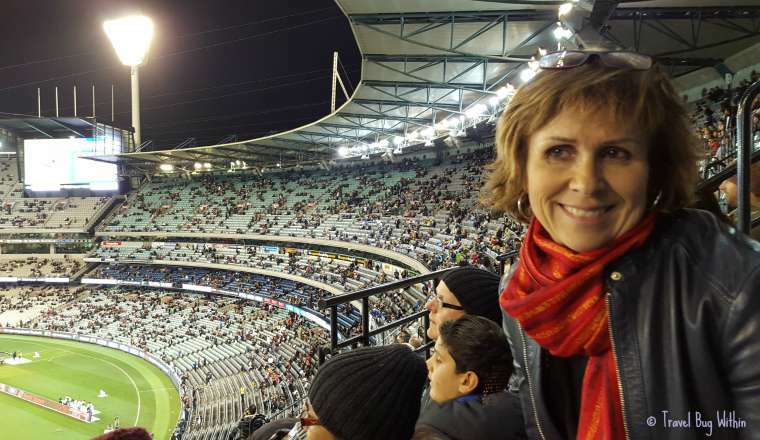 I consider the MCG the holy grail of Aussie sports grounds, so I was just a little excited to experience the MCG for my first time! 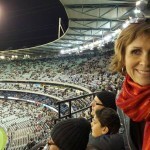 Oh the MCG hallowed grounds! Next morning was a slow start. The weather forecast advised it was a chilly one degrees in Melbourne. 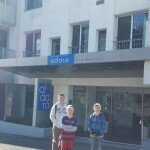 A tram trip to St Kilda was on the agenda and once miki cards (public transport currency) were purchased from the closest 7-11 store, we headed into the city by tram, then out to St Kilda. Sometimes you meet characters on public transport, like the old Egyptian Italian 80+ year old who happily told those around him he spoke four languages! His recollections of Egypt in WWII kept us entertained until he departed at his stop. Arriving in St Kilda with no plan of where eat, we strolled down to the boardwalk, towards a couple of restaurants offering tables in the sun (if you were quick – the sun was moving fast!) Republica appealed and with hot chocolates and mochas ordered and the boulevard to people watch, it seemed the perfect place to enjoy our Sunday morning. 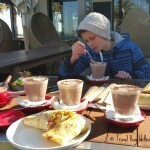 The breakfast wraps my eldest and I ordered were delicious. A wander back on the tram to the Arts Precinct where we looked around Southbank and walked the iconic Princes Bridge over the River Yarra. 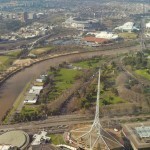 We visited the Eureka skydeck for an aerial view Melbourne from the 88th Floor. 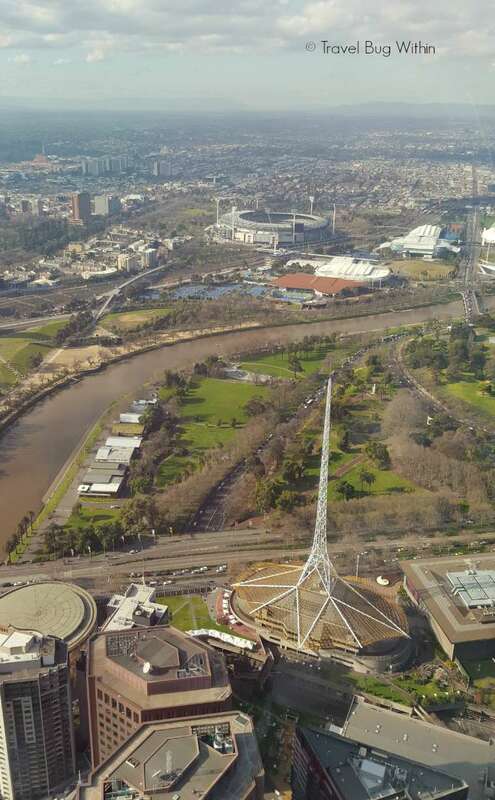 Fabulous to see the MCG, Rod Laver Arena and the Soccer stadium from this 360 degree viewing platform and it helped we had a clear sunny day. 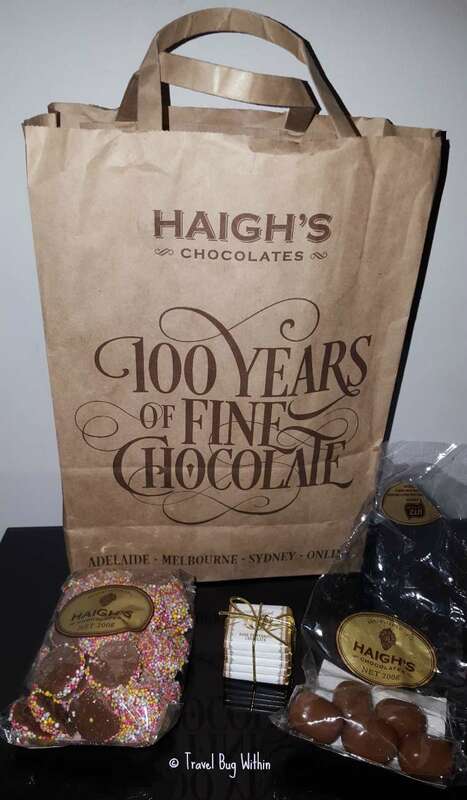 Cost $53 for a family of five – worth it and the boys loved it. Back to the hotel collect luggage and return to the airport, head to baggage services and retrieve my SLR camera (accidentally) left on the plane the day before. HUGE relief from me and big thank-you to QANTAS staff for handing it in. A much deserved wine for Mum and Dad in the QANTAS lounge before heading home to Brissy. Melbourne in less than two days – it can be done and the memories hopefully will endure. Blogging about it makes sure of that! Did we give the lads a taste of Melbourne? I think so. And will they return? I’m sure. Ever been to Melbourne? What are your favourite places? 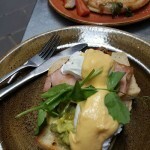 Brilliant Jen … I’ll be sure to visit a few of your recommended haunts next time I’m in Melb. They are lucky boys – and huge kudos to you and G for making this so special for them. 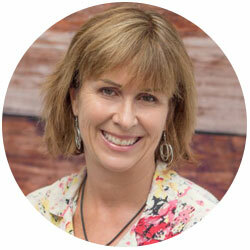 Thanks Karen – was fun – but over too quickly! Wow! You were busy. Melbourne has the best laneways doesn’t it? 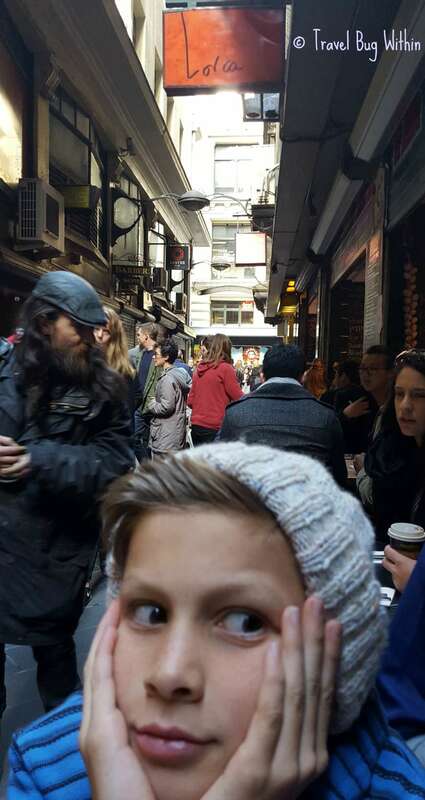 Can’t help but love the Laneways Jodi – even if my boys didn’t! It sounds like you packed a lot in. Personally, I’d be super-excited about seeing Cristiano Ronaldo, not because I’m a big soccer fan, but because I’d be able to tell my sons, who I’m pretty sure know who he is.